Accompanying the 2011 change was a rule that candidates not be allowed to talk about their platform. Since then these restrictions have loosened due to public backlash. Still, however, candidates must be careful what they say. “As a candidate we’re not allowed to say anything against Vancity, we’re allowed to talk about Vancity issues, but we’re not allowed to trash Vancity,” said Lisa Barrett in an interview with The Mainlander. Furthermore, a candidate is not allowed to promise to do anything if they are elected, or endorse fellow candidates. As a way of quelling these concerns, Virginia Weiler, chair of the Vancity Board, wrote a letter to members in 2012. The letter stated that the Board would be responding to concerns about the Board-approved candidate recommendations. The Board would do so, the letter stated, by introducing a second factor into the selection process. Instead of only having the Directors recommend candidates, four members-at-large would join the selection committee. What was not made clear in the message was that there would still be two directors involved in the decision making process. And precisely how these four people would be selected and by what criteria was still not apparent. Tim Beachy, Rick Christiaanse, Theo Lamb and Bill Walters were selected by the board to serve positions on the committee in 2012, for which they were compensated $3,000. Each of them kept those same positions in 2013, working alongside the two directors. Far from speaking on behalf of the average member in the selection process, the member portion of the committee is disproportionately influential and Board-connected. Rick Christiaanse is on the Translink Board, Bill Walters has a government position as Director of Settlement and Multiculturalism, Tim Beachy is the former CEO of United Community Services Co-op, which has partnered with Vancity on projects in the past, as well as having been contracted by Vancity to conduct research and recommend changes to director remuneration in 2005-6, according to Barrett who was in attendance at the 2006 AGM where the report was presented. Adding a few members into the recommendation process does not automatically make that system more democratic. The more likely result is to deflect criticism while ensuring continued Board control over election process. Prior to the 2011 system of Board endorsements, candidates were running a slate called the Action Team. The Action Team was started by a group of progressive Vancity member in the eighties (including figures like Tim Louis) as well as members with NDP ties. The group was formed in response to a politically right-leaning Board of Directors of the time. Prior to the Action Team, a similar system of recommending candidates was in place — something that the Action Team opposed. The latest incarnation of the Action Team held a majority on the Vancity board before the slate system was retired. Current board members Patrice Pratt, Virginia Weiler, Jan O’Brien, and Allen Garr all formerly ran in the Action Team slate. One of the founding members of the Action Team, Bob Williams, is a former NDP cabinet minister. He was elected to the board again in 2007 as an independent candidate and has been outspoken in his criticism of the new Action Team. In 2009 he endorsed three candidates, including Barrett and Holm, who weren’t part of the slate. In 2010 he alleged that the Action Team-controlled board had “promoted greater corporate secrecy,” by forbidding directors to speak publicly about Vancity business. Vancity decided to retire the slate system in 2011, banning anyone from running on a slate, and introduced the recommendation system in its place in order to make elections more “transparent.” This was based upon a member survey from 2009 that, while not publicly available, apparently showed that only a third of members were satisfied with the election process. 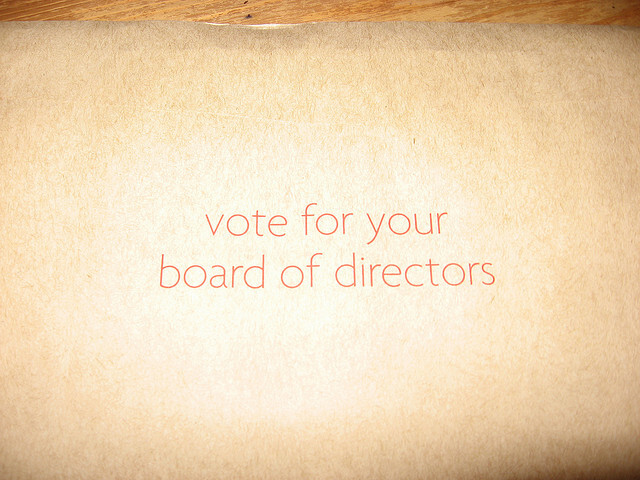 The recommendation system effectively extends board control over who gets elected. In Mark Latham’s paper “We Want Our Co-ops Back,” which uses Vancity as an example, he examines the process by which a co-operative, supposedly member-run organizations, put power in the hands of a few, who then use that power for their own benefit. This process tends to happen as the organization increases in size, and as member control diminishes, there is an overall tendency for the organization to change its legal status and become privatized, no longer member-run. The current system of recommendation increases the possibilities of patronage, a process which Latham describes in general terms: “…any co-op with a mission to serve the broader community in addition to its members, has the potential for the dominant group of directors to channel the co-op’s largesse toward its allies,” Latham explains. “These may be political allies, business allies, academic allies, personal friends, or family. Effective democratic competition is needed for members to keep potential abuses in check. Supporting the community is fine, but should not be used for the directors’ personal benefit, directly or indirectly via allies.” Indeed, the lessening of “democratic competition” appears to have concentrated power into the hands of a small number of allies. These recent developments at Vancity could have wider implications. Catherine McCreary was previously part of the Action Team slate, and was chair of the Nominations and Elections Committee in 2011 when Vancity began recommending candidates. She was recently appointed to the FICOM’S Credit Union Task Force to develop a set of policies to guide the governance of all credit unions in British Columbia. Their report suggests that a system of having the current Board recommend candidates should be standard. If these recommendations become policy, they will be applied to every credit union in BC. The current Board of Directors is composed of the chair Virginia Weiler, vice-chair Jan O’Brien, Teresa Conway, Anita Braha, Allen Garr, Greg McDade, Bob Williams, David Wong, and Patrice Pratt. Among this group there are a Board members who stand out in the context of political patronage and elite power in BC and beyond. Teresa Conway is the CEO of Powerex, a subsidiary of BC Hydro which sells and trades power around the world. The company was successfully sued, along with various other companies in the last year, for allegedly manipulating the market to inflate energy prices in California. At the time, Conway was not currently the CEO, but held another executive position. David Wong was appointed in 2011 by the Board after Ian Gill resigned in 2010. He is an executive at TeeKay corporation, a company involved in shipping oil tankers. Jan O’Brien is best known as the Provincial Secretary of the NDP, and is also the wife of Geoff Meggs, a Vision Vancouver councillor. Virginia Weiler has been involved in various organizations including work on the Board of Smart Growth BC, a non-profit organization that aims to guide development in BC, promoting higher density, environmentally friendly projects, and “diverse” neighbourhoods with a range of incomes in close quarters — an urban planning idea often used to justify gentrification policy in the DTES. Another Board member, Allen Garr, is also a pro-gentrification advocate, and was a vocal ally in Vision’s decision to convert promised social housing at the Olympic Village into market housing. Garr has used his articles in the Courier to attack Ivan Drury and low-income organizers in the DTES (in particular read a previous Mainlander article on an encounter in 2012: “Allen Garr attacks the poor, loses all credibility”). Furthermore, while Vancity represents itself as a progressive company in relation to the DTES community, they have recently funded various projects that have contributed to the gentrification of the DTES. In addition to partnering with luxury developer Westbank, they also hold ownership shares in the highly contested Save on Meats Ltd. Most recently Vancity threatened to stop funding a neighbourhood community group (Carnegie Community Action Project) citing protest activity, including perceived links between CCAP and the Pidgin picketers. Their blackmailing resulted in CCAP’s forced resignation of long-time DTES organizer Ivan Drury. In the past, Vancity’s investments have come into question. Vancity holds shares in Suncor Energy Inc, which is one of the major operators of Canada’s tar sands. They currently defend this relationship on their website, calling Suncor “a good example of a progressive company.” Until as recently as last year Vancity was an Enbridge investor but has divested from the company due to public pressure. Overall, Vancity is an institution with a great amount of influence over the cultural and social landscape of Vancouver, particularly as an entity with a history of funding ‘progressive’ causes. For this reason, it is highly troubling that Vancity operates under a model which concentrates influence within the hands of a small group of people. I did not vote for any of the recommended candidates. I think the recommendations are unfair because they discriminate against the other candidates, particularly those who don’t have the resources to conduct a campaign against the sitting members and their power base. I have not been happy with Van City’s direction of late and their support for the community seems to be cherry-picked towards their own biases. It is too late for this year but next year I think some of the candidates who weren’t recommended need to get in touch with each other and pool their resources to conduct a more visible campaign. We need alternate voices on the board. I believe voting is to April 25. I’m not a Vancity member but have just been reading up on this interesting subject. I could see an existing board recommending candidates based in their financial literacy and background, but from what i have read, this recommendation thing has the explicit purpose of continuing an entrenched club of political activists. No surprises. The three winners were recommended, and the 5 recommended candidates did better than everybody else. Ellen Woodsworth was a distant 6th. That said, I like the 3 winners. I read through all the bios and watched all the videos and ended up voting for the 3 winners (first time that’s ever happened for me). Going in, I planned on voting for Ellen, but but her bio and video was so much weaker than everyone else’s. No endorsements, no passion. I couldn’t do it. MEC has received similar criticism for recommending candidates for its elections (I didn’t pick all the winners in that election but I think the 4 that won are all good choices). I don’t think recommendations are a bad practice. Definitely has room for abuse, but from what I’ve seen the candidates that are recommended are often the best ones. I’m more worried about the candidates that don’t make it to the ballot. For transparency, it would be good to have their bios published somewhere so members could verify they were excluded for the right reasons.